Now i have FINALLLYYYY compleated my collection and been able to buy my third Jean Paul Gaultier Limited addition diet coke bottle, i feel it is now appropriate to comment on how I love his Spring/summer 2013 ready-to-wear collection ! I always feel his collections stand out to be a bit more edgy and exciting than other designs however he is renowned for that i suppose. i feel that i NEED one of those Gaultier belts they would make any outfit just that little bit more spectacular ;). 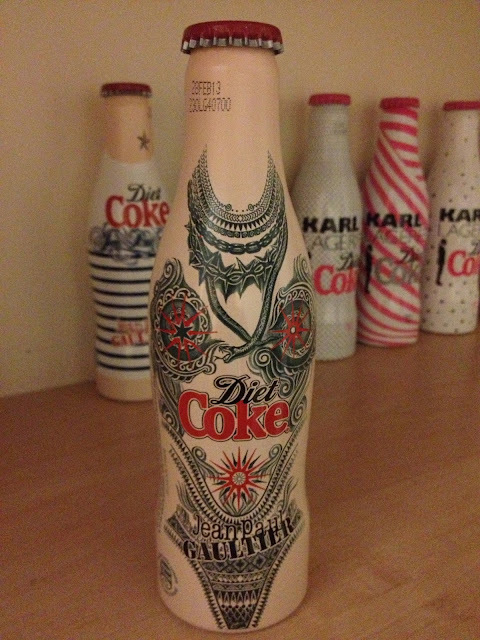 As for the Diet coke bottles OMG they are amazing after finding myself hunting around for the Karl Lagerfeld ones last year i was soooo happy when a new collection of them came out .. i bought my first to in june? time i think in Harvey Nichols London and my last one newly released in boots where apparently is the only place you can buy it. i had to buy two regular diet cokes for £2 !!!.. to receive it free so i was all in all very happy although i am not a fan of diet coke haha.